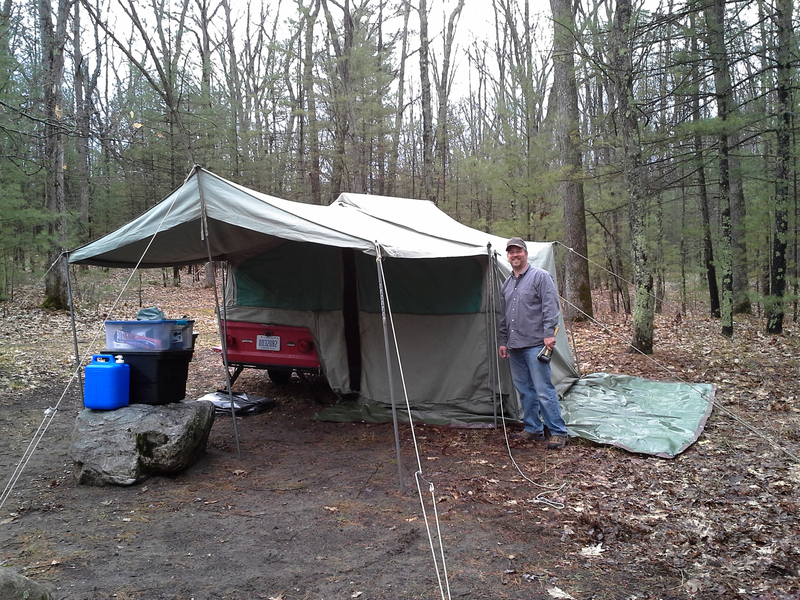 We had a late start camping this year finally meeting up at Leverentz Lake which is centrally located in Lake County, Michigan and therefore putting us close to several great trout streams. 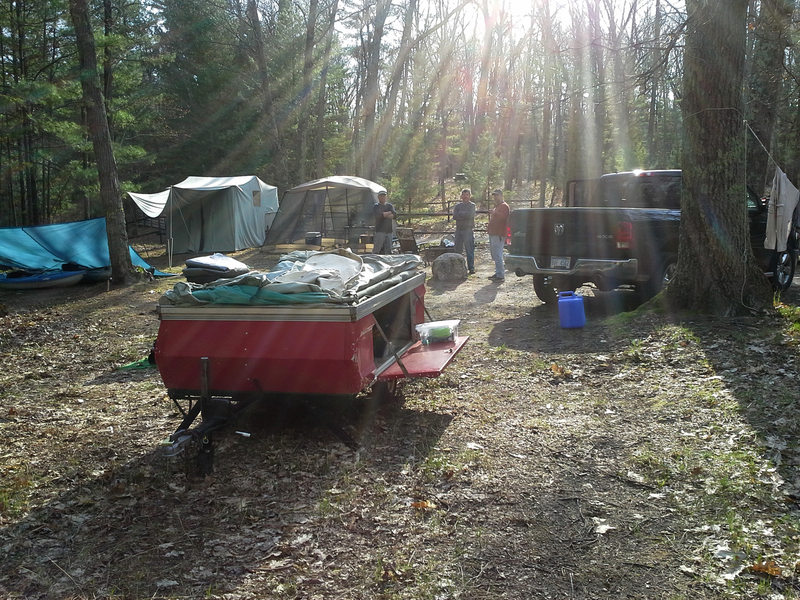 We set up camp on wet ground and were surprised when Natch showed up with a vintage 66 Apache Chief camper. I had my 61 Apache Chief so if you are a fan of old campers and swung in you would have seen two classic campers made in Michigan a half a century ago. Natch’s 66 Chief is in great shape including the canvas. His version has a rubberized floor (Nice!) and an add-a-room option that zips into the awning. (click on any photo to enlarge, backbutton to return) I’ll do a separate post on his camper sometime in the future. 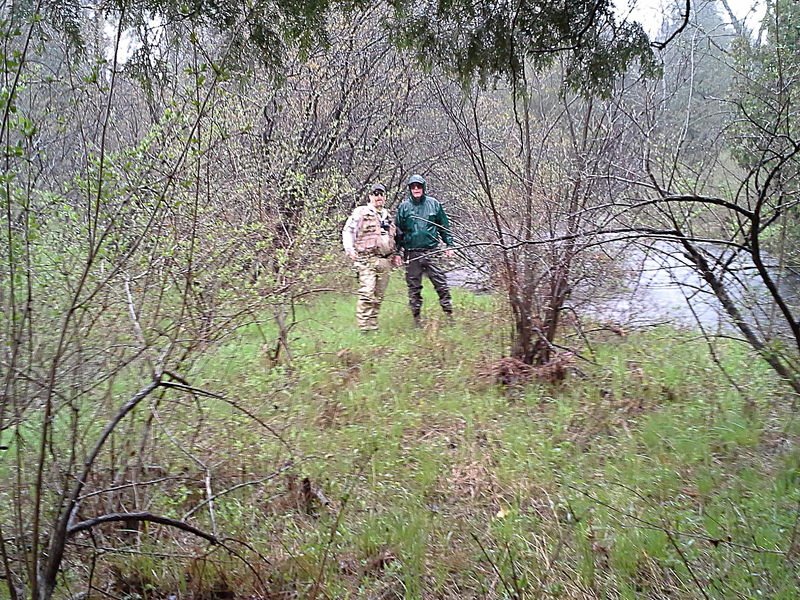 We ran up to the Pine River with the idea of stopping at our morel mushroom spot first and then hitting the stream. The morels were up. Feral scored a nice bag of about 30 and Natch and I picked up another dozen or so. The Pine River was flooded but we had guessed that ahead of time. We went in south of six mile road and cut off a couple short stretches mostly casting from the bank. I caught a brown trout about 17 and tossed him back figuring we were camping for a few days and would likely catch more if we wanted a trout dinner. Thunderstorms blew in and the next morning we woke to a downpour. When that happens, and in Michigan we count on it, we put on waders and rain jackets and look for fishable trout water because hanging out at a wet camp is no fun. We knew the Pine was flooded and, from experience, the Little Manistee, The Baldwin and main tributaries to the PM, the Middle Branch and Little South would be at flood stage and impossible to wade. So Natch, Feral and I drove to a far upstream (headwaters) stretch of the Little South where the water is is normally a foot deep. It too was flooded but at least we could get in the river. Rain came down in sheets and wind gusts rocked the treetops. Feral commented it looked like tornado weather as the sky took on a strange color. Natch and Feral are trout addicts like me so we spent several hours getting in and out of the stream and casting every piece of trout cover. I went fishless but Feral and Natch each caught several in the 12 to 16 inch range and released them. Natch was wearing a go-pro camera so at some point maybe he’ll send a video I can post. 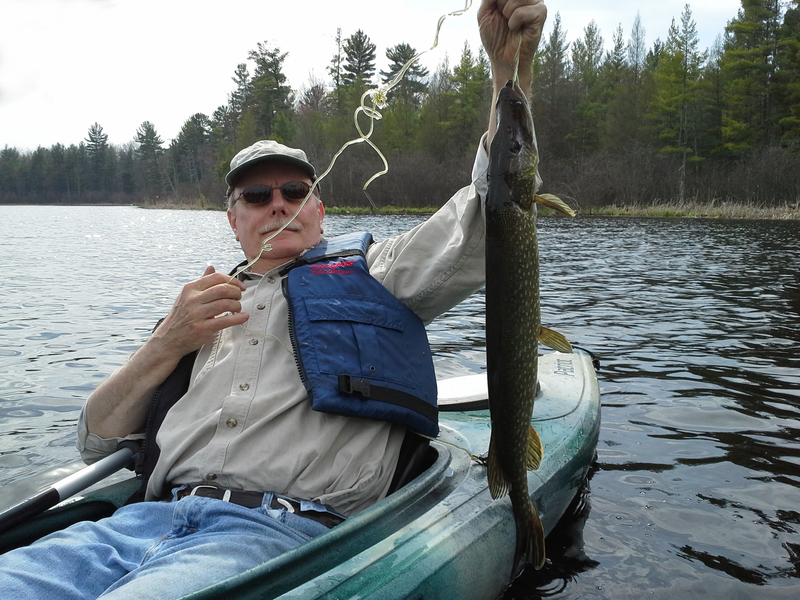 This might sound like blasphemy but one reason we released all trout is because we were thinking about pike for our trout camp “fish dinner.” When the weather broke we went out on Leverentz Lake with our kayaks and I was fortunate to catch a pike around 26 inches that provided a nice plate of boneless fillets. Natch also got lucky and caught the biggest bass I’ve ever seen come out of Big Leverentz. Might have gone 5 pounds but we didn’t have a scale handy. 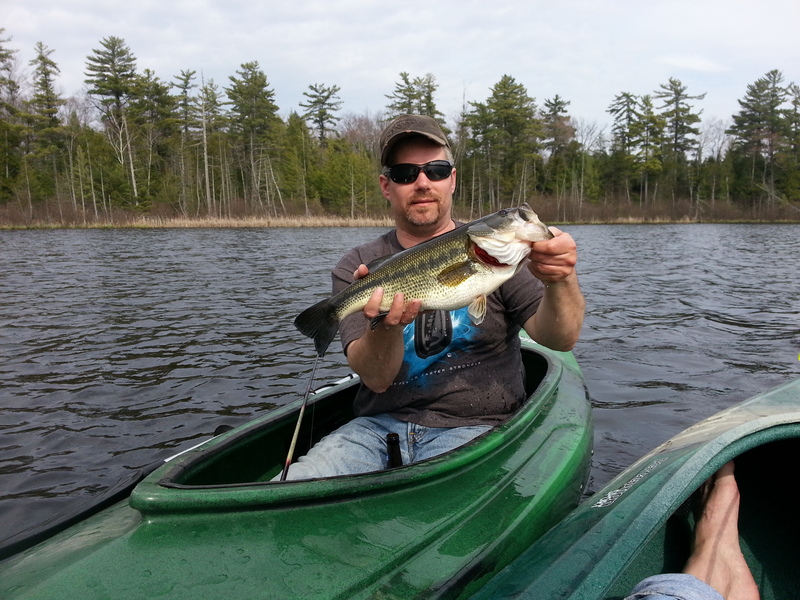 He released it because it wasn’t in season and we don’t normally eat bass. 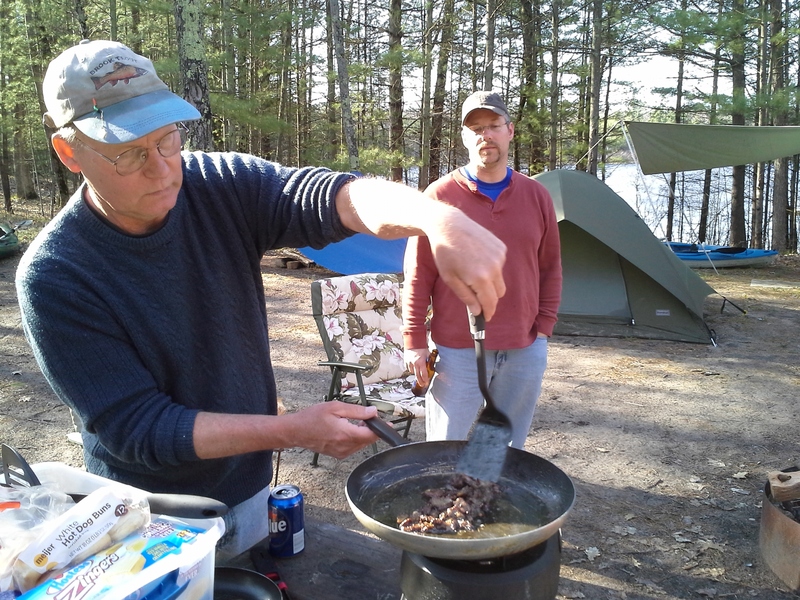 Feral prepared a fried morel mushroom appetizer as a prelude to our pike dinner. A couple beers and trout camp magically transformed from dreary Kansas to the Land of Oz. On Saturday, Keith rolled in. 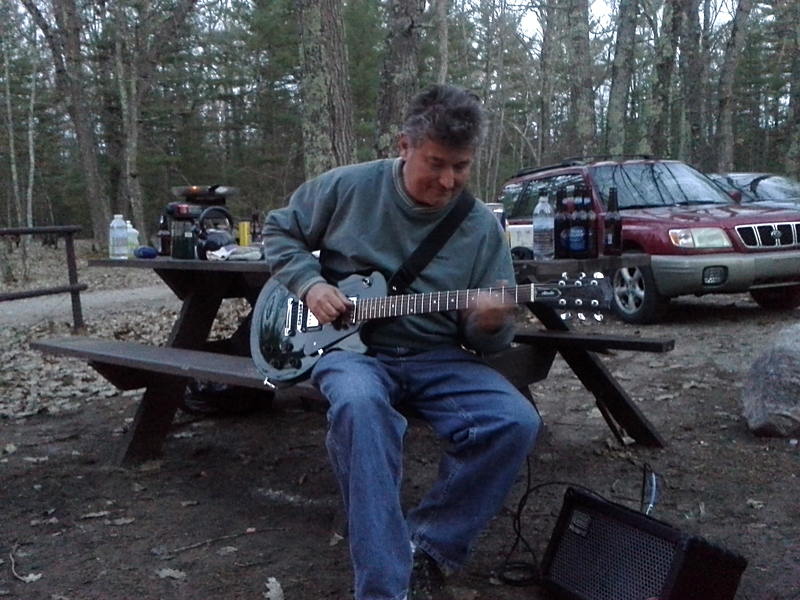 Keith has been to a couple trout camps now and when the guitars come out at dusk it is his job to play the heck out of some of the classic rock songs that we all know but can’t remember the words to. So that puts Feral, lead vocalist for “Rock Bottom and the Out-of-Tuners” in a position of having to make up words on the fly while I struggle to recall old songs that combine killer electric guitar with some acoustic guitar – so I am at least contributing something. Not an easy job if the Labatts beer is flowing. I always mention Keith’s exceptional guitar playing but he is a story teller like Feral and Natch with a vast reservoir of odd experiences. So the guitar is great but he fits right in as person. When Natch and I took him morel mushroom hunting with dubious results (2) it wasn’t a problem. We just knocked down a cold beer and talked about whatever came to mind. So guitar or not, he’s in. 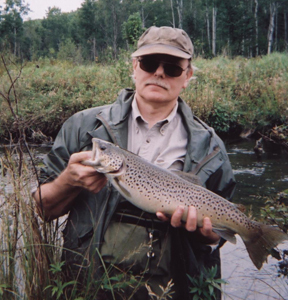 I’m always circumspect about asking non-fishermen to trout camp mainly because if it rains we fishermen take off for the streams. If it’s overcast we hit the lake. Keith seems to have a radar about the weather and shows up at just the right time – sunny and seventy and time to jam. It was all over way to fast. The lake was beautiful and we had the campground to ourselves. We caught trout and pike. Morels were up. A great start to another year.